The above quote is what you would read if you google HPP. We have been talking about HPP since we started back in early 2012, Educating consumers that these juices are not raw like they claim. There are no laws in place right now that forces juice cleanse companies to tell the truth that they are using HPP. .
HPP is just another way where something that is healthy and amazing for you is taken and turned into garbage. Raw juice does not last 45 days or 60 days. And you can not preserve the live enzymes and nutrients for that long that’s why if you taste a juice that is HPP it will taste different and watery compared to a raw juice made from raw ingredients and in its raw state. Also yes you are killing the bad pathogens they may occurr in the juice when it expires in its natural state in 5 to 7 days, but at that same time you are killing all the good bacteria as well. Your body needs both those bacterias, the bad builds up your immunity and the good bacteria is amazing for your gut. Conclusion: HPP is only about profit, its about prolong the shelf life of the juice to make it easier for companies and it has nothing nothing at all to do with your health. 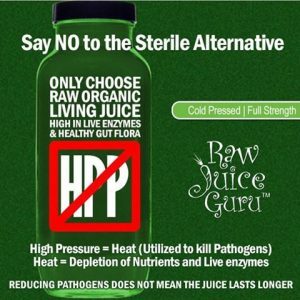 The sterile alternative to actual RAW juice is not what you should use when doing a juice cleanse. Point of a juice is feast your cells on all the live enzymes and raw nutrients and the amazing gut flora. All these are destroyed when you HPP. Live enzymes die withing 5 days of a raw juice and they CANT be prolonged. The only thing HPP is prolonging is companies making money of you drinking sugar water. Because once those live enzymes are dead than that juice becomes all sugar. One of live enzymes million job is to break down that sugar and if they are no longer there than all that is left is sugar. Remember there is no law right now in Canada or even the USA that makes companies tell the truth. So here clues to look for. So how do you know if a juice that is claiming to be raw is actually HPP? 1- you can not HPP glass bottles. The high pressure process can only be done on juice in plastic bottles. So if juice is in plastic it’s 99.9 percent HPP. 2- Its sold at big chains like whole foods, planet organic, drug stores, loblaws, Rabba, sobeys, Metro, Walmart, and Costco. It’s all about big stores making profit. No big grocery chain is going to carry a juice that will be expired in 5 days, so a shelf life of 45 to 90 days is perfect for them and perfect for the juice company as well since nothing will go in the garbage. 3- Companies that hpp their juice will never tell you the day it was juiced and bottled and if they are not sold in stores they don’t have to tell you expiry date either. In the grocery stores Its the law for them to put expiry date. Check the expiry date and remember a RAW juice does not and can not last more than 5 to 7 days. If it does its no longer raw and has been processed. 4- Look at the bottle itself. HPP is very watery because the fiber is lost with the hpp process. Look for the separation that happens in the juice. If a juice claims it has 8 different leafy greens and apple in it, 45 percent of the bottle should be separated between the water and the fiber. If I confused you I apologize. Raw juice separates when it sits there, its a natural state and it tells you how much fiber is in the juice. I know many think that raw juice does not have fiber, they are wrong.